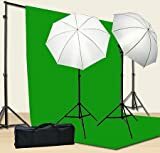 Amazon has the chromakey Green screen kit 800w photo video lighting kit 10x12 feet Green screen and Backdrop Support System Included Ul15 10x12 Green By Fancier U15 10x12 Green for $114 with free shipping. Sells for $119+ Highest Price. Deals for $95 Lowest Price. Normally $111+.